Locke is a thief (er, treasure hunter) who works closely with the Returners. The Returners call upon Locke to accompany Terra out of Narshe safely, and later to infiltrate Imperial-occupied South Figaro, which results in Locke rescuing Celes from captivity. Locke distrusts Terra ("that Imperial witch!") and Celes at first, but upon rescuing either of them shows unusual determination to keep them safe. 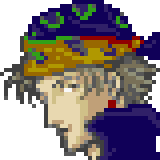 Locke accompanies the team for the entire first act of Final Fantasy VI, often as a mandatory party member. Locke has high Speed, decent Strength, low Magic, and average Stamina. He can equip only light armor and shields, but can wield every dagger (including the powerful Valiant Knife) and most of the best swords (including Lightbringer and the Ultima Weapon). Locke can also use the Steal command, which can score you some rare items and equipment if you check CoN's bestiary for what different enemies hold. Steal can change to Mug if you equip the Brigand's Glove, and the chance to successfully steal increases if you equip the Thief's Bracer. Each monster has two slots in which they can carry items. One slot holds the item you'll most commonly see being stolen, which is generally called the 'common steal'. The other item is the one you'll want, and this is the 'rare steal'. Locke has, when he successfully steals, an 87.5% chance of going for the common steal, and a 12.5% chance of going for the rare steal. If one of these spaces is empty, it will still be included in the decision between the two items. If the common steal slot is empty, you're already looking at a 7/8 chance of failure before anything else is calculated. Your Steal attempts won't always be successful. Remember, it is the opponent's interest to keep hold of its belongings. The chance of Steal working depends entirely on your level and the opponent's level. Speed is no issue, so raising it won't increase the success rate of Steal. What will make for a better thief is the Thief's Bracer. The Thief's Bracer doubles your chances at stealing. It won't stack with another Thief's Bracer (the +5 Speed bonus will, but the special effect won't). The Brigand's Glove will convert Steal to Mug, which basically combines the Steal and Attack commands into one.